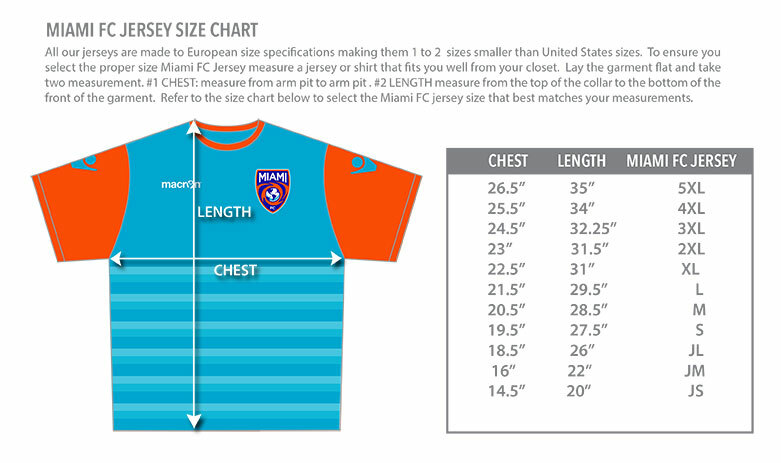 PLEASE AGREE TO THE SIZE CHART TERMS: Required I agree that I have used the size chart information on the second image of the product images provided to purchase the correct sized Miami FC jersey. Customized jerseys can not be returned and jersey purchased at the wrong sized can be exchanged of a 10% restocking fee plus the cost of shipping. Official Miami FC Goalkeeper Jersey for the 2019 season. Miami FC official design by Macron. This Miami FC 2019 Goalkeeper Jersey is a mix of orange and black with The Miami FC crest over the left side of the chest. This jersey is short sleeve. • Modern design with knitted collar and knitted short sleeves cuffs.